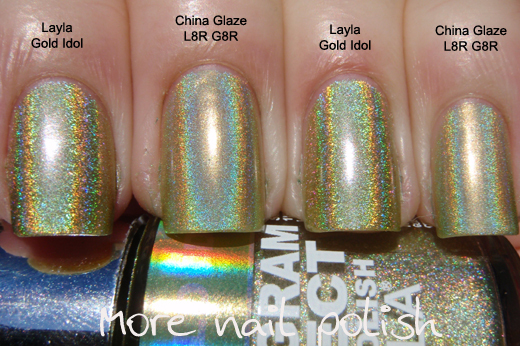 As promised, here are the comparison swatches I have prepared for the Layla hologram polishes #9-16. Just to recap for any few visitors, you can find swatches of all the Layla Holos in Part 1, Part 2, Part 3 and Part 4, as well as swatch comparisons of holos #1-9. Layla Gold Idol compares very closely colour wise to China Glaze L8R G8R, although the holo effect in the China Glaze polishes is so much smoother and finer. Layla Emerald Divine is most close to Nubar Reclaim. 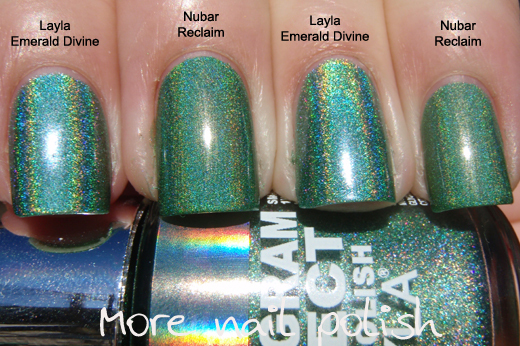 Emerald Divine is lighter and bluer and has a much stronger holo. Layla Purple Illusion is really close to China Glaze QT. The holo effect in Purple Illusion is much stronger and because of the rainbow fire it makes it look more blue. 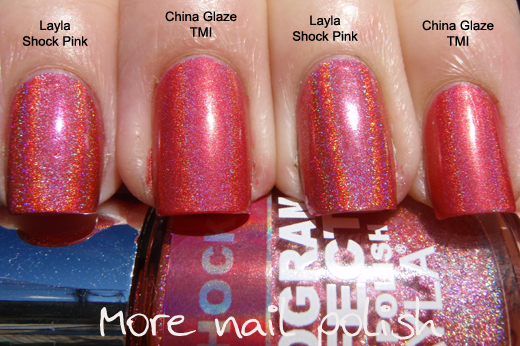 Layla Shock Pink is like a flasher sister of China Glaze TMI. Finally, I was requested by a few ladies to swatch Ozotic 518 next to Layla Red Taboo. I though I would throw in HITS Ares too seems I was comparing Red Holos. Now you can easily see why I say Red Taboo is just not a red! I hope you find these comparisons helpful. Love the comparison! Holos are so expensive, I appreciate seeing them side by side so I know what I want to buy. 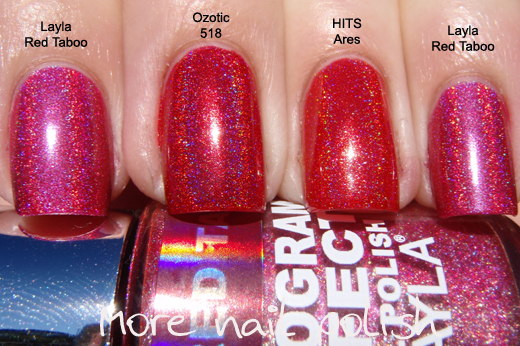 Fab comparisons...I could only wish I had as many holos in my stash as you do! Why have I never seen this brand before? Off to look, but I'm hoping it's not Australia exclusive, they look so good on your nails!